Alright. I posted my review for the first book, Frostfire, this morning. I was less than thrilled with it, but stuck with it so I could read and review book two. Ice Kissed is ten times better than the first book. Seriously, I could not put it down. In fact, I’m really glad I stuck with book one because I enjoyed book two so much. For starters, there was tons of action and intrigue and mystery. There was some in book one, but it was really just a lead-up to book two. There is a kidnapping, royal conspiracies, murder, and lust in book two. Paired with the things I did enjoy about book one (IE, Amanda Hocking’s writing style and description), I was very bummed to finish book two so quickly. There was significantly less worldbuilding in book two which was a plus. I was sick of it from book one, so it seemed to have gotten it all out of the way. The modern day references still throw me off, though. By the end of the book, my heart was broken and I was feeling all of the feels. I was torn between shock, “I knew it!”, and horror for Bryn. Without realizing it, I’d gotten to know her character pretty well over the past two books. The other characters are much more robotic and awkward, though. Overall, I would definitely recommend this to those who enjoyed the Trylle trilogy and who enjoy modern day paranormal fantasy YA. I rated Ice Kissed a 3.5/5 on Goodreads. It wasn’t my most favorite book in the world, but I did enjoy it. 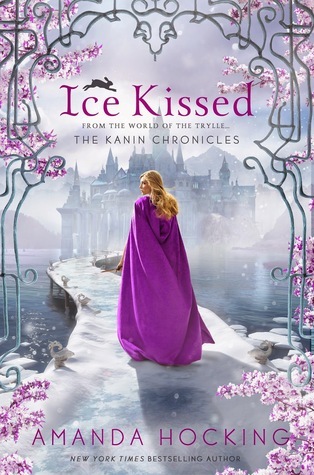 I received a free copy of Ice Kissed from NetGalley in exchange for an honest review.